This building is a rare remaining example of a Victorian Flatiron industrial building in Los Angeles. Even though much of its original detailing was removed after the 1933 Long Beach Earthquake, it still retains most of its original structure and serves as a visible reminder of Late 19th Century Los Angeles and particularly as one of a few remaining vestiges of the now lost “River Station Area,” which noted the warehouses as an important link to the rich railroad history of the area. Originally housing the California Ice Company (ice factory), then New York Suspender Factory, its longest service was to the Rafael Glass Company, owned and run by Charles Raphael. Charles Raphael was one of the pioneer businessmen in Los Angeles. The family owned several businesses including their largest business, the Rafael Glass Company, a primary supplier for window glass in homes and shops in the rapidly expanding Southern California area. Raphael originally built the structure to house retail sales and lofts. However, his plans altered with the rapid transition of the neighborhood from residential to industrial. Sanborn maps and other attachments show the early evolution of the building and the neighborhood. The proximity of the building to the River Station Area of Southern Pacific Railroad led to its inclusion within the original boundaries of Historic Cultural Monument No. 82, “The River Station Area.” The warehouse was built at that location in order to utilize the railroad as the first building of the several in the block, known as the Junction Block, to be served by a railroad siding. The tracks for that siding are still in the ground along the Baker Street side of the building. It is believed to be the second oldest warehouse still extant in the downtown area, with only the Capital Milling building being earlier. 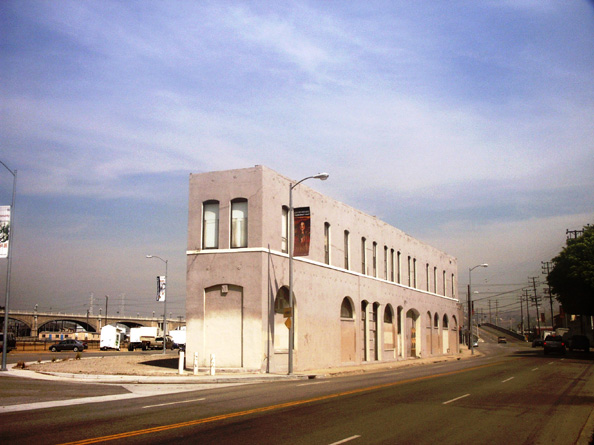 The building, in spite of some alteration, is still a rare early example of industrial warehouse in the Los Angeles Area. Charles Raphael was killed in an industrial accident in the building in 1905 when he was supervising the unloading of a 1-ton load of glass. When supporting lines slipped during unloading from a horse drawn truck, Raphael was crushed to death. The Raphael Company retained ownership until 1934. Prior to the glass company, part the building was leased to the California Ice Company.